Recently I had the chance to spend the afternoon with some family members of various ages at the Castle Park in Riverside, California. What seemed to be a little local place when we arrived surprised us with more and more attractions and winding paths around every corner. The youngest members of our party raced from ride to ride, gleefully hopping from airplanes to flying elephants to motorcycles to rockets and more. The nostalgic carousel appealed to all ages, while the thrill-seeking teens in our group headed for the towering, teeth-rattling attractions like the Falling Star. One of the highlights was a ride on a small-scale vintage fashioned train, a thrill for my young railroad fans. The train took us around most of the park and gave us a sneak preview of many of the rides and attractions, such as the Log Flume and the Dragon Coaster. The Inland Empire’s humid summer weather made us especially appreciate the water misters that sprayed us gently and cooled us off so we could enjoy the afternoon. It’s a nice touch added by the park operators and truly made the experience much more comfortable and pleasant. Boardwalk-style carnival games taunted us with colorful plush items begging to be brought home. 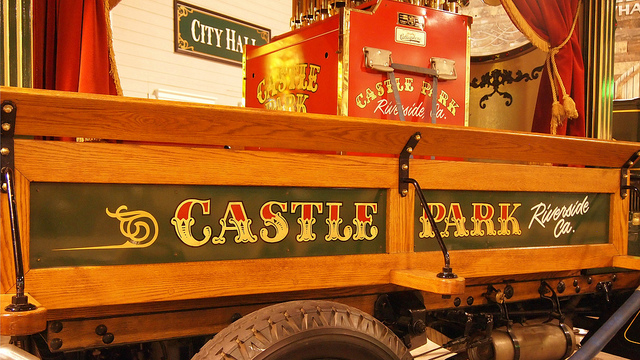 Carts and stands offered treats of all kinds – even that amusement park standard funnel cake is offered in this compact park. In addition to the kiosks and food carts there is an on-site circus-themed Big Top restaurant. The park offers party packages and also accommodates meetings and group events, with party planners on staff to make sure events go off without a hitch. A fully loaded (and air conditioned) arcade with over two hundred games fills the inside of the ivy-covered castle. There are also four complete 18-hole miniature golf courses complete with fountains, gorgeous landscaping and amazing structures and visuals. The 25-acre park is beautiful during the day, but the lights after dark really make it dazzling. 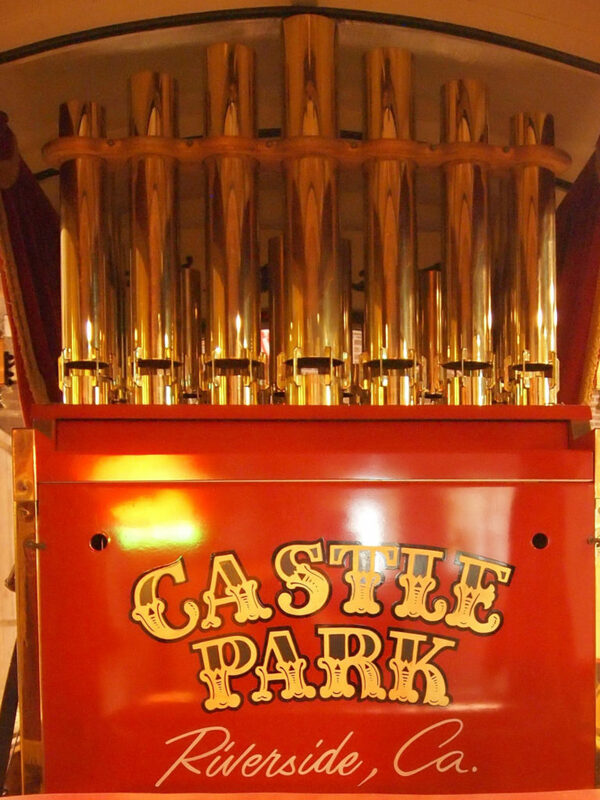 Castle Park also does some redecorating for Halloween and runs special events and promotions throughout the year.